Did Ellie go to a new home or are you planning on keeping her? Ellie has not gone to a new home, and at this point, I am going to keep her, unless there is another single girl in the near future who I could pair her up with and sell them together. 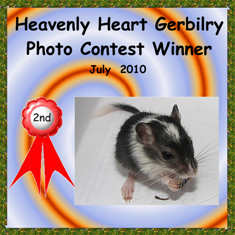 How do you enter the Heavenly Heart Gerbilry photo contest? 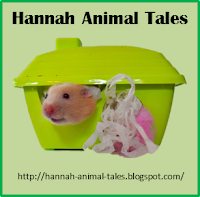 I have read all the rules and how to submit a photo but I still don't understand so I thought I would ask you as I saw many of your photos(that you have shared on your blog) in the results of each months photo contest. 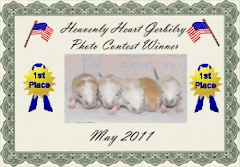 Is there a deadline date to turn in photos for like the December photo contest? 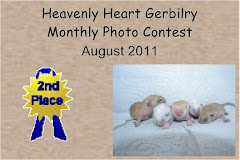 The deadline to enter your pictures is the last day of the month before by midnight. However, December is holiday bread month, so there is no contest in December. 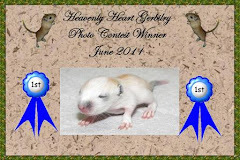 If you get your picture in by December 31, you can participate in the January contest. 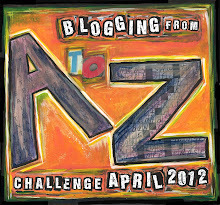 If you don't get it in on time, it is automatically entered in the next month's contest. Thanks again, Mack, for the great questions!